A few weeks ago I was a guest at the King of Bangers 2010 in Kings Lynn. In advance of the main sausage tasting (from six Kings Lynn butchers) we sampled the cheapest sausages from five supermarkets. 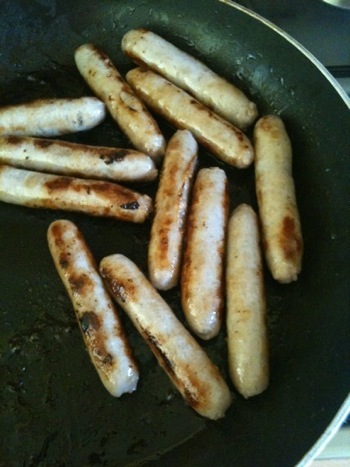 Tesco value sausages were voted the worst in the cheapest sausage heat with a score of 2 out of 105. In the interest of fairness I thought I should sample the other end of the Tesco offering hence on a sunny Saturday morning I found myself cooking Tesco Finest Chipolatas. As you can see the price was £5 for two packets so not bad value. The value sausages were, I think 47p a packet so I had high hopes that these would be at least five times better than those! 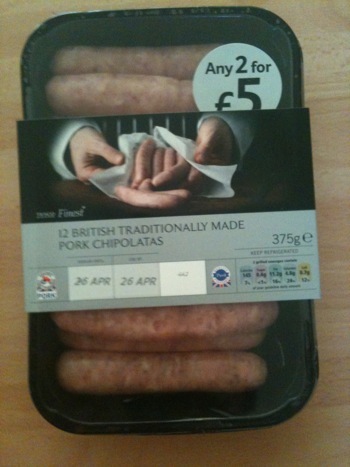 I couldn’t see anything on the packet about the country of origin of Tesco’s pork. I will try their website later on to see if I can get clarification on this. It would be nice if they were supporting British Pig farmers 100%. 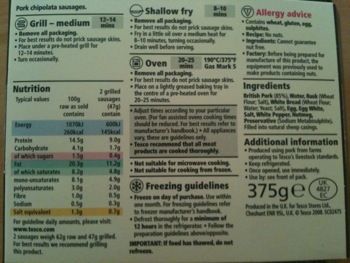 375g is 12 (unlinked) sausages. I fried the sausages this morning with the help of my side-kick, the three year old Sausage Prince! The sausages did seem to lose a fair amount during cooking but the sausages cooked evenly and (by choice) I cooked them slowly and fired up the heat at the end to brown the skins. 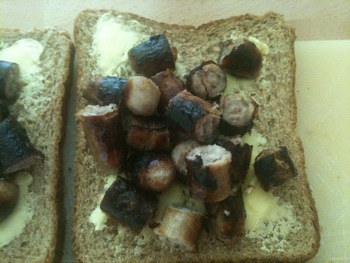 We went for sausage sandwiches with basic brown bread and butter. 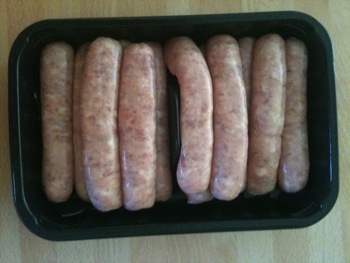 These sausages were definitely better than Tesco Value (which hopefully comes as no surprise)! They were at least ten times better but this would have only got them a score of 10/105 with the locals at the Woolpack in Kings Lynn. They tasted a little fatty and slightly salty and the fatty taste increased as they got cooler. They tasted reasonably meaty but I don’t think I would have enjoyed them that much if they had got too cool. Overall they were ok but not something I would seek out to try again.